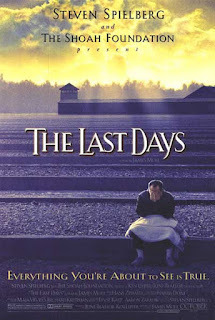 Tag line: "Everything You're About To See Is True"
James Moll’s Academy-Award winning documentary The Last Days follows five Holocaust survivors living in the United States as they attempt to find closure with a past that haunts them daily. The five: Bill Basch, Alice Lok Cahana, Renee Firestone, Irene Zisblatt and U.S. Congressman Tom Lantos, were in Hungary when the Nazis rounded them up in 1944, shipping most off to Concentration camps. The Last Days tags along with these men and women as they return to the place of their birth, to the ghettoes where they were forced to live, and, in some cases, the camps where they were held prisoner, and where many of their family and friends were put to death. Each of these survivors has made a life for themselves in their new country, yet the memories of the nightmare they escaped, and those they left behind, remain. As you can imagine, the stories these five relate are beyond horrifying. Through interviews, The Last Days fills us in on the atrocities they were subjected to, as well as their individual tales of survival. Ms. Zisblatt tells of how, as a young girl in one of the death camps, she hid diamonds, given to her by her mother, from the Nazis, keeping them safe in the only place she could: her body (she would swallow the diamonds, pass them, clean them off and then swallow them again, which she did continuously for over a year). But the film’s most poignant scenes show these men and women returning to the locations they once considered hell on earth. Bill Basch is unable to control his emotions when, accompanied by his son, he revisits the camp where he was held prisoner. Mr. Basch recounts everything that happened there, and the very act of remembering is a painful experience. By way of several wide shots, we see him, silhouetted against the abandoned grounds, weeping, and we cry right along with him. 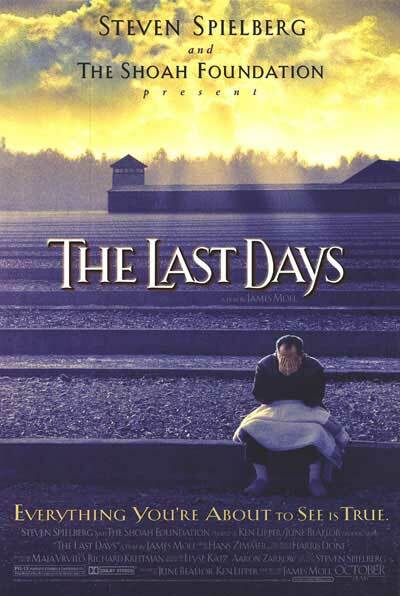 Executive-produced by Steven Spielberg, whose Shoah Foundation is dedicated to videotaping and archiving the recollections of thousands of Holocaust survivors, The Last Days serves as both a heartbreaking reminder of a terrible moment in history, and the moving story of five people who escaped the chaos with their lives, and are making sure nobody forgets those who didn’t.